"Fake news" has become a troubling phenomenon, allegedly used to manipulate voters and fuel a rise in global populism. In one case, it inspired a man to shoot up a Washington pizzeria. On Monday, scientists revealed some of the reasons for the explosion of hoaxes and lies on social media—an information overload has left consumers unable to discern the good from the bad. "Our results show for the fist time that low- and high-quality information have the same chances to succeed," study co-author Diego Oliveira of Indiana University's School of Informatics and Computing told AFP. "And such a lack of discrimination is a result of our limited attention and the amount of information (to which) we are exposed." Hoaxes and fake news, the team found, are just as likely to go viral as well-sourced, accurate information. The way it is constructed, the "social media market rarely allows the best information to win the popularity contest," said Oliveira. In 2013, the World Economic Forum listed the threat of digital misinformation "wildfires" as a top risk for our society. One form is "fake news"—a term used for falsehoods, presented as truth, that are spread via traditional news channels or online social media to influence people or attract clients. Such misinformation is suspected of having been used to try and influence the 2016 US presidential elections. "Fake news" reports of a child-smuggling ring with connections to Hillary Clinton operating out of a Washington pizzeria, saw a man storm the eatery last December firing an assault rifle. The authors of the new study suggested cutting back on "bots"—algorithms with fake "profiles" on social media networks. They flood the platform with messages on a certain topic in a bid to marginalise other viewpoints. Such bot accounts "make up a significant portion of online profiles and many of them flood social media with high volumes of low-quality information to manipulate the public discourse," said the research team. "By aggressively curbing this kind of abuse, social media platforms could improve the overall quality of information to which we are exposed." But consumers can do something too: source your news well. "Using social media as a source of news is not very reliable unless one focuses only on posts from trusted media sources that follow established journalistic practices," said Oliveira. "Our friends are probably not good editors and are driven by emotions and biases more than objectivity and trustworthiness," he added. "We should not assume that if something is shared by a social contact it is reliable, and we should avoid sharing something without reading it critically." The study into what the team called "the digital misinformation that threatens our democracy" was published in the journal Nature Human Behaviour. It followed the spread of thousands of memes on platforms like Twitter, Tumblr and Facebook. Facebook unveiled a tool last December allowing users to report deliberate misinformation. 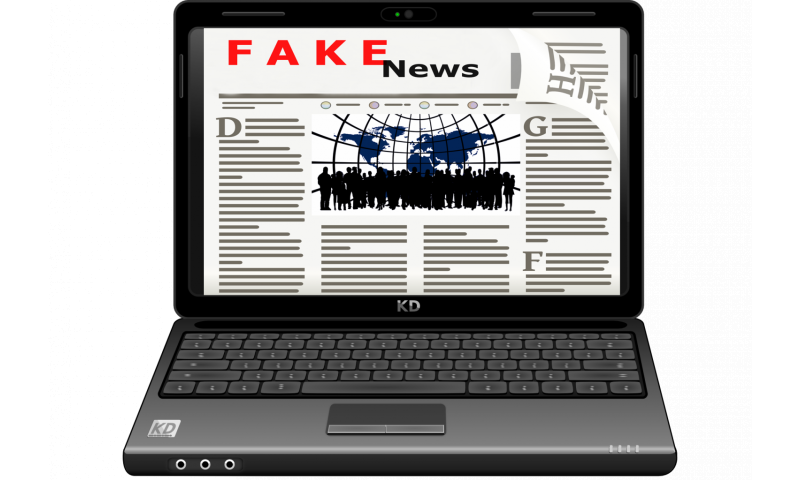 The term fake news is also used by US President Donald Trump and his followers to describe reports in traditional media that they do not agree with, further muddying the waters. Sure it doesn't have anything to do with parenting and understanding human rights? Social media sites should use the same kind of tools email servers use to spot spam, including finding waves of extremely similar content distributed through different accounts. Then assign a human admin to engage some accounts in that network to challenge them to prove their humanity, like a Turing Test. That can't be 100% effective against fake news botnets. But it would make it far more expensive and so cut down most of its asymmetric infowar power. Of course the main defense would be a legitimate journalism industry that did its actual job, but even its own survival hasn't inspired that kind of ethical professionalism for decades now. The writers are paid to write what they do, by editors and publishers who distribute it. And in turn by their corporate sponsors. But without a gullible audience their product goes nowhere. Your inability to recognize what the science explains just supports the science. You've got Dunning Kruger disease. As long as there's a quick buck to be made, buncoing the gullible, almost without any consequences for the unscrupulous? The Peter Principle applied as an instantaneous meta-meme to elect a senile buffoon to the office of POTUS. Disinformation is a standard tactic. It's relatively easy to identify at the individual level but relatively difficult to fix at the mass level. The Nazis used disinformation with great effect. It's not like propaganda is a new idea or anything. This is why they, you know, teach, like, history and stuff in grade school. It's the same mechanism that brought the Nazis into power (who never got a majority of the votes, either): People just didn't bother to go vote thinking "it will be fine - no one will vote for them, anyways". Guess what: Radicalized people are motivated to vote. Complacent people aren't. So theturnout of the 'vocal minorioty' will always be far higher than that of the 'average Joe'. It's even got a technical term in politics: Asymetric demobilization (and political parties are actively using it to dissuade voters from taking up their right to vote). You're reporting that you're thinking wrong? First step to recovery I suppose. Wow. No bias in this article. Every instance of "fake news" in it has to do with alternative media using it against the Red Queen. Not once do they cite the hundreds of times where ABC, NBC, CBS, MSNBC, PBS, CNN, the NY Times or WaPo have relied wholly on a single anonymous source from an administration still staffed by Obama poison pills to breathlessly accuse Trump or his people of treason and other crimes. Nearly all the time, their fake news is quickly debunked by the alternate media they despise. Half the time, they bury correction/retractions after the obits, while they simply ignore the facts that disprove their fakery in the rest. The whole "Russian collusion" crap is built on nothing more than Trumphate, while they ignore the Clinton pay for play not only with Russia but with the entire world. Why would anybody pay $500,000 + to hear either Clinton mouth platitudes for 30 minutes, unless they expected access to Her Highness after her expected victory? Every single thing you just posted is a lie drawn from the fake news you're padding your denial with. Trump's National Security Advisor and his campaign manager already resigned and now signed retroactive registrations as paid Russian agents for years, through the campaign and inauguration - signed confessions. Trump's VP Pence lied about his Russian meetings, as did Trump's Attorney General Sessions, changing their story every time their lies were debunked with evidence. That Donald Jr meeting with the Russian agent trying to get a Russian trove of emails hacked from Clinton and the DNC was straight up treason. Meanwhile there is not a single "debunk" of the real news that's upsetting you so. Lying to pretend there is doesn't debunk anything, it just doubles down on lying. You're defending treason. You're a traitor. Your protests are the work of a Russian agent.